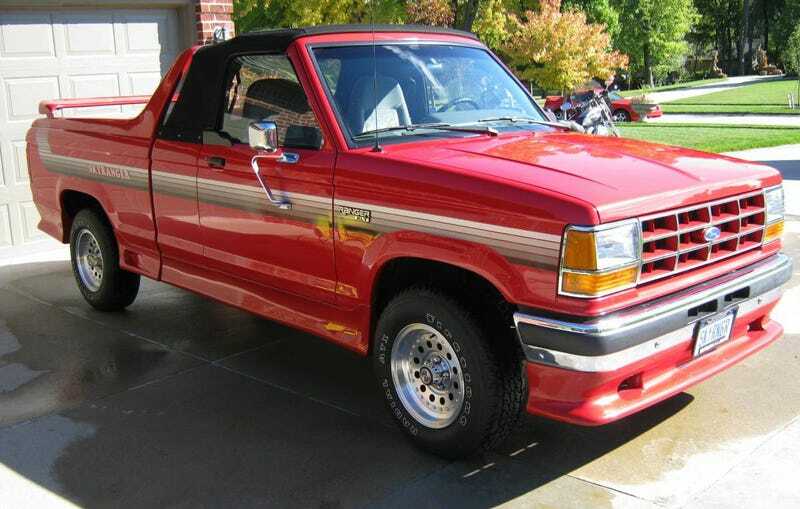 Have you ever wanted to drive a convertible pickup truck that is named like a superhero? If so, then today’s Nice Price or Crack Pipe Skyranger might be the truck for you. That is, of course, if its price doesn’t prove super villainous. We had another squeaker yesterday. I would have preferred a moaner or a screamer, but the vote on the 1984 Nissan 300ZX 50th Anniversary Edition proved inscrutably close and so squeaker it is. That ended up being a 52% Crack Pipe loss so there you go. Another place you can go is back to the old west where a Ranger, a certain Lone Ranger, proved to be the prototypical superhero with his masked identity and penchant for doing good as opposed to the easier, and more fun route of doing evil. Unwilling to time travel that far even metaphorically? Well then, let’s just go back to the last century and have a look at this 1991 Ford Ranger 4X4 that was amazingly transformed into the superhero-named Skyranger. Why Skyranger? Well, because of that convertible top of course. Drop that and the entire heavens are your playground. Rent free too, I might add. Ford apparently commissioned American Sunroof Company (ASC) to build these wacky trucks, which were based on the 4.0 V6-powered 4X4 extended-cab. ASC unceremoniously (actually, there may have been a ceremony involved, the historical record is hazy) Hassan chopped the roof off, replacing it with a canvas folding affair, and then added a hoop and wing to the bed. The addition of rocker and valance extensions give the truck a lowered appearance, but it’s still rocking the 4X4 ride height. The work appears to have been done very professionally, which is to be expected of ASC. It’s also pretty wild visually, and perhaps was too much so for Ford which put the kibosh on the project after only about 17 were built. I’m guessing a factor was the odd rearward italic of the SKYRANGER name in the passenger side stripe. I mean, that’s all kinds of freaking me out. This one squeaked out (there’s that word again) before the end of production, and looks to be in as-new shape. The paint appears perfect and the interior, with its sport buckets and creepily phalic five-speed shifter looks like it’s never left the dealer lot. A contributing factor here is no doubt the modest 7,300 miles on the clock. The present owner claims to have owned the truck for seven years, but to have left it in a climate controlled garage for the past four. He says it awoke without issue and today drives as if new. Along with the truck you get an original brochure and build pics from the ASC factory. The A/C has been converted from R12 to R134 so much like a hippie this truck is both funky and strives for environmental benevolence. One final note, it appears that the seller also owns a Triumph TR6 so he’s obviously one of us. What would one pay for such a unique and interesting ride? Well, not thirty-four grand, as that was what the seller asked last month on eBay to no takers. He now has it on the list de-Craig at $24,999 and we now need to all take a minute and vote on whether or not that’s enough of a better deal. What’d o you think, did he hit the mark this time? Or, did that price not swoop in superhero style—and save the day? H/T to EHOLD N for the hookup!